Discussion in 'Auto News' started by GTPNewsWire, Feb 5, 2019. This article was published by Joe Donaldson (@Joey D) on February 4th, 2019 in the Automotive News category. It's like someone reached into my mind and took nearly everything I've ever wanted from a Singer 911 and applied it to my favorite road-going Porsche. dice1998 and Nismonath5 like this. Not feeling those wheels but its a stunning looking car nonetheless. SVX and MisterMR44 like this. 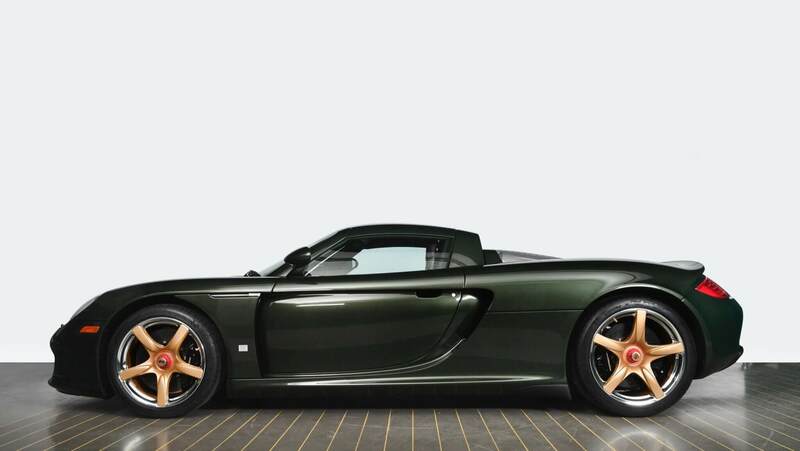 Was wondering just the other day what a green Carrera GT would look like. Not quite the green I had in mind but hot damn it works!! All I know is I want to be rich enough to plate my magnesium wheels with silver. Nexus and palqo like this. Same idea as when George Lucas went back and changed the original Star Wars years later. What was wrong with the way it was? The Carrera GT is good as is but this custom restoration is a bit more special. Because unlike movies, cars can be conformed to the wishes of the owner? In the long run it will prove to be a mistake as the values of original cars keep climbing. And? Ultimately if the car went through Porsche Classic, then the owner knows what they are giving up in terms of worth or monetary value, and is fine with taking the hit as long as they find enjoyment in the vehicle. Eh, only if the owner is looking at it from an investment point of view. I'm guessing, considering all this work, they're probably not too concerned. Colour is a matter of opinion but to me. PsuPepperoni and andrew84555 like this. Cars that are modified to suit one person’s particular taste will always have limited appeal come resale time. And that time always comes, one way or another. In the meantime the owner gets to enjoy it in its modified state at the expense of what it took to get it there and supposed future losses (which is to say supposed reduced rate of appreciation compared to unmodified examples). Well, yes and no. PTS Carrera GTs are very rare, and retain their value well above a standard GT Silver/Black example. For example, Fayence Yellow is fairly rare to find and the color helps keep value; 1 example with 6,000 miles sold for $800,000 recently. However, Signal Yellow is a PTS example and 1-of-1, and has over 7,000 miles. It moved in Philadelphia for $1.2 million. The example in this thread is most likely an above-average value car. Yes, it is far more personalized than any other PTS example and the value may take a hit due so. However, because it is a fully restored car from the bare chassis & the engine was rebuilt to new condition by Porsche themselves, it becomes a virtually "brand new" example and that will offset any hit the car may take from its unique finish to new buyers. Really, the fact that Porsche has done all this work themselves is the saving grace. All this work could've been done by a non-Porsche shop like this example and taken a big hit; this Rubystone Red may be a Porsche color, but it was done aftermarket by Galpin Auto with other details altered (paint is good, has a couple re-fitment issues) and thus, this car has taken a huge hit. If Porsche Classic had done it, there would really be no issue (& at bottom market dollar, it's the perfect example to have them redo it). Or if it was left alone in its original GT Silver finish with those miles, it'd be a $800-$900,000 example all day. Anyway, I'm not so sure most Carrera GTs will be going through Porsche Classic to have new 1-off paints or interiors. I have a feeling Porsche Classic will more likely be a way for owners to restore their cars back to factory new standards, similar to the few Ferrari-approved workshops that bring vintage Ferraris to Classiche-certified levels. Bit late on this part. Car was unveiled around 3 months ago, right after the Porsche RM Auction there. Nexus, Heldenzeit, XJ40 and 6 others like this. I doubt any of the McLaren F1 restored by MSO or Lanzante have lost value in the process. McLaren F1s are a special breed, though. You can put 70,000 miles on one, and it'll sell as much as a 0-use example. The CGT is very close to there, though. The market's a bit dry right now, they're all silver & black, most examples are now listed by P.O.R, and the huge upswing they had the last year or so has calmed down. If owners hold onto their cars, the Carrera GT market will become like the F1 market; whatever few units you see going for, is where the market sits, regardless of use as many prefer to go after driven examples than garage queens. lol this thread. Seeing some of the responses about the value tanking or that it should have been left the way it was I had figured he had blinged the interior or changed the engine to an LS7 or something. I didn't know that the extent of it was having it repainted during its frame off restoration and having the seats reupholstered. By Porsche. Nexus, SVX, TenEightyOne and 3 others like this. Not bad at all but not the best looking Porsche (personal opinion). I came here expecting to see Salomondrin's ex-CGT and I'm not disappointed. Unpopular opinion incoming: it looks awful. I honestly believe that this colour scheme is going to be a case of you either love it or hate it. While I do not doubt the quality of the workmanship in rebuilding the car, the choices that the owner has made in regards to colour, makes it look like something a child would do to their car in GTA. Im sure the owner is proud as punch, but it's certainly not my taste. Give me a regular silver CGT anyday. having it repainted during its frame off restoration and having the seats reupholstered. By Porsche. This is the thing that some people seem to be missing. It's basically had an all-over works service and refresh. I don't really get how a 15 year old car would need a complete restoration... unless it was badly damaged, on fire, or a combination of both. I doubt that the work done to it will affect its value negatively. It's probably just what some buyers with deep pockets actually want too. Not me though, that's ugly. That colour on a Zagato is exactly what I'd want. McLaren F1s are also immune to depreciation because they're quite rare. Speaking of zero use examples, remember that one that turned up in 2017 that the owner never took out of the packaging? Whatever happened to that one? It's because the owner is rich and wants to make it theirs. McLaren and RCKakashi14 like this. I think the premise of being able to "re-tailor" the car to a new owner under Porsche's care leaves one to just go ahead and have other parts of the car attended to as well. There's some speculation it stayed in Europe; THJ posted a jet that supposedly came to discuss the car. Logs showed it came from Toulon-Hyeres to an airport nearby THJ. THJ marked the car as sold a day or so later, and the flight log showed the jet went to Newcastle that same day. Then, it returned to Toulon-Hyeres shortly after. So the car got sold? I just hope the new owner is having fun with it.